I’m pretty well packed for my road trip to Calgary, which starts this morning. My partner and I packed a 14” Meade SCT telescope in the back of my Tesla last night. It just fits in the back with the back seats still upright. I jam other stuff around the telescope so it won’t move when I’m underway. My travel bags, snacks, drinks, and camera gear go into the back seat. I have a medical appointment this morning, but arrive at the ferry terminal at 12:10PM, identify myself as a senior in order to get a free passenger fare on BC Ferries, and get on the 1PM sailing to Tsawwassen (see banner image above). I grab a Cobb Salad from the snack bar and have lunch in a quiet area of the ship. The Strait of Georgia is calm as we cross to Tsawwassen, arriving on time at 2:35PM. Driving Highway 17 along the Fraser River to Surrey is a stressful start to my road trip since it is so congested with trucks. The Langley section of the Highway 1 freeway is under construction, so it isn’t much better, except as an electric vehicle I can use the HOV lane to bypass some of the congestion. Once I get to Mission/Abbotsford the traffic starts to speed up and thin out a bit, and past Chilliwack is easy going all the way to Hope. The Hope Supercharger is located right downtown, so while my car charges for 40 minutes, I go next door to the Dairy Queen and splurge on a small Blizzard. Hope is a very run-down town, so I’m glad to get out of there and onto the Coquihalla Highway. The speed limit is now 120 kmh along most stretches, so that combined with the steep climb out of Hope to the Summit means my Model S is using 450 watts/km of energy, as compared with about 200 watts/km in the city or on flatter sections of the highway. Of course, I get some regeneration on the descent from the summit, and the stretches on the last half hour along the Nicola Valley into Merritt are much flatter. 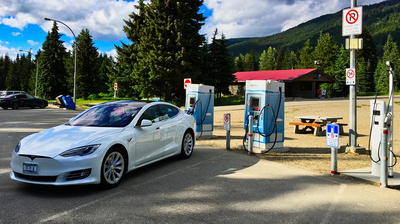 I stop at the Britton Creek Rest Area to have a look at the pair of Fast DC chargers and a Level 2 for electric vehicles. This allows shorter range electric vehicles to now make use of Highway 5. Previously they had to stick to Highway 1 or 3. After checking into the Comfort Inn in Merritt, I meet a fellow amateur astronomer to transfer the telescope to his car. I’m glad to get rid of that beast, so I have more room in my car. The hotel appears to be brand new, and is located right beside the highway and airport, but I find it is quiet and well-run. This entry was posted in British Columbia, Canada and tagged electric vehicle, EV, ferry, highway, road trip. Bookmark the permalink.